Rainforest frogs might be neat-looking and often colorful creatures, but the many meat-eating animals in the forest see them as tasty snacks. From birds that swoop down and grab frogs in their talons to big kitties that pounce on them, the amphibians have plenty of predators to worry about. But some frogs have nifty ways to avoid those that want to eat them. Frogs scurrying about the rainforest always have to be on alert for reptiles that see them as a snack. The amphibians' primary concern lies with snakes, from pythons to boas. Near the water's edge, alligators also become a concern, but because snakes slither around on the ground and climb trees, they pose a greater threat to frogs. Other reptiles and even amphibians, including monitor lizards, tiger salamanders and bullfrogs, feast on frogs, but typically of the smaller variety. Looking down from the canopy above are winged animals that often have excellent eyesight and strike with quickness and precision. And many of them fill their bellies with smaller animals, such as frogs. Examples of frog-eating birds includes toucans, owls, hawks, hornbills and, in some cases, eagles. Eagles often prefer larger meals but will target frogs if they're hungry. Most rainforest frogs probably don't want to see tarantulas, and thanks to the large arachnids' camouflage and hunting strategies that often involve silence and waiting, most frogs don't see them until it's too late. National Geographic notes that tarantulas generally burrow and live in the ground, which would seemingly give an advantage to frogs who spend most of their time in trees. However, arboreal tarantulas -- tree-dwelling arachnids -- exist as well, posing dangers to frogs high off the ground. Many mammals of the rainforest, including monkeys, sloths, tapirs and anteaters, eat fruits, vegetables, forest vegetation and insects, but predatory mammals do exist, mostly in the form of cats. The small ocelot particularly enjoys frogs as part of its diet, but larger cats, such as jaguars and leopards, eat the amphibians if they're in need of a meal. While lacking any semblance of decent eyesight and not a walking kind of mammal, bats also regularly make meals out of frogs during the night, typically locating them by the sounds the amphibians make. For some frogs, the only defense they have against predators is their awareness, quick movements and powerful legs that enable them to spring high into the air. Others have certain quirks that either make them off-putting as a meal or startle predators. 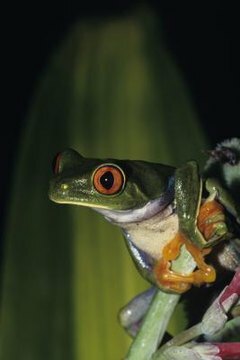 Consider the red-eyed tree frog. Its intense red eyes can momentarily stun would-be frog killers. Another example includes a frog whose defense mechanism kills almost all predators of the amphibians: the poison dart frog. According to National Geographic, a snake known as leimadophis epinephelus serves as the only natural predator to most poison dart frogs, thanks to the snake's resistance to the frogs' poison.